Fast and powerful for smooth performance with low vibration, the Sewing Head 200 is specially designed to meet the requirements of high production. Regardless of how though the working environment is, Fischbein’s heavy duty precision components will give you years of dependable performance. The Sewing Head 200 is a high speed sewing head used for plain sewing of every type of open-mouth bags, including paper, woven polypropylene, jute, burlap. Specially suited for nett bags. Typical application for this sewing head: potatoes packing line. The Sewing head requires to be mounted on an appropriate frame (see "Fischbein" sewing systems) and the mandatory use of a fan specially designed to cool the unit during operation (not delivered with the unit). 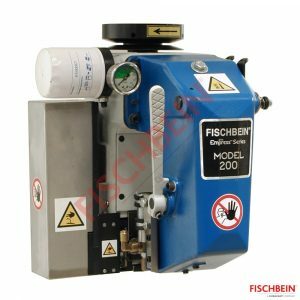 Built with traditional Fischbein craftmanship, the Sewing Head 200 features a pressurized, self-lubrication system which protects moving parts from dust and particles, ensuring maximum productivity and low maintenance.